Shriya Malhotra is an urban researcher and artist working with Partizaning in Moscow. She is a participant at this years reSITE conference, and her work aims to engage citizens in a participatory arts-based practice. She holds an MA in Cities and Urbanization, and her main research focuses on urban sustainability, mobility, public health and social inclusion. Shriya has collaborated on community arts and research projects in Buenos Aires, New York, New Delhi, and Moscow. Partizaning is not just a name of a website, but a word to encompass a new phenomenon, an experience combing street art and social activism. 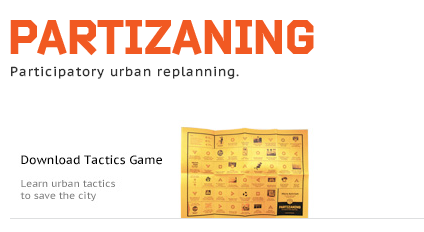 The key is point from the founders states, ” to demonstrate in a revolutionary tradition how self-motivated, unauthorized statements and unsolicited action can become key drivers of social and cultural change.” The international, interdisciplinary team at Partizaning has an overall goal to promote participatory urban planning to improve cities through various tools of civic action.